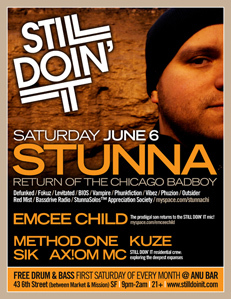 As he is one of our favorite producers and favorite guest dj’s, it was only a matter of time before Chicago’s STUNNA returned to rock Still Doin’ It with his seriously deep-dished grooves. But that’s not all! Former SDI resident Emcee Child returns to the microphone as well. Are u dumb? 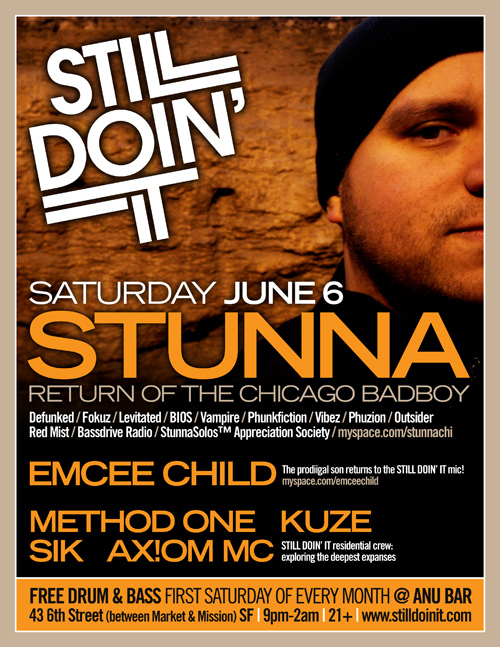 Of course, no SDI is complete without the residential crew of Method One, Kuze, Sik and Ax!om MC. This is one night not to be missed! A classically-trained jazz pianist and working musician based in Chicago, STUNNA (aka J. Cappo) has crafted his own unique sound within the fast-paced world of Drum + Bass music. With a number of strong releases on various high-profile labels worldwide and a solid Stateside and international touring schedule under his belt, this host of BASSDRIVE Radio’s popular ‘GREENROOM’ show is determined to spread his own sound as well as exclusive tracks from producers around the globe. 2009 is destined to be another busy year…..
Looks like it should say Saturday, June 6. I can’t wait! Date is fixed. Considering the the wrong date was only up for about 15 minutes, you guys are truly eagle eyed! first time visit to a still doin it show last night! had a good time, (‘cept for when girl-is-loud and screaming-boyfriend intercepted Ax!oM during method one’s set and kept him from the mic for a significant couple of minutes). see you all next month!